out of the ordinary or simply something I hadn't noticed before. calculated the average difference to determine league parity. hoping some might find this interesting anyway. Maybe he slips just a bit in May, but it looks he usually starts well. If he had had alot of bad starts, these numbers would look different. 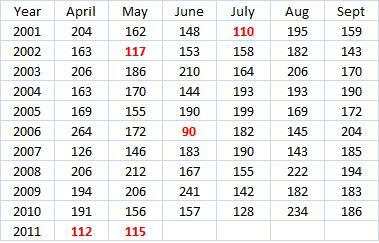 April includes March and Sept includes Oct. All the months he has had an OPS+ under 120 are in red. He only played 10 games in June 2006 and must have been hurt. He has never had two straight months under 120. It looks like he has only had under 150 in back-to-back months once. He finished pretty strong last year, so it is not like he was starting to tail off then. Maybe pitchers are not as afraid of him as they used to be or maybe having Holliday and Berkman behind him having good years keeps Pujols from being intentionally walked. This should mean he is seeing good pitches so he should be performing well (of course, the research on protection shows it does not have much effect). He has also grounded into 14 double plays already this year. His average is 20 or so per season. But we are not even at the one-third mark. His rate is 26%. That is, he grounds into DPs 26% of the time there is an opportunity. That is twice his career average and the next highest is 16%. Maybe he has just been a little unlucky so far and things will even out. The league average is 10% this year and since Pujols came into the league it has been 10-11%. No doubt his being only 10% better than the league average in walks is partly due to not being intentionally walked. If I account for IBBs, he falls from being 32% better to only 14% better. Notice that he has improved his relative strikeout rate. The big drop is isolated power. He has been 89% better but now is only 4.5% better. Brian McCann just did it a couple of days ago (pinch hitting in the 9th). I asked HR expert David Vincent (of SABR and Retrosheet) "Do you know how many times a player has hit a game tying HR in the 9th inning and then won the game with a HR in extra innings?" Here is the list he sent me, used with his permission. The hot link will take you to the boxscore and/or play-by-play for the game, as it does for McCann. Jeff Heath also pinched-hit in the 9th inning of his game. His winner was in the 10th inning and both were off of Ewell Blackwell, who was pitching in relief. It is interesting that this was only done once before 1985 and has been done 10 times since (including McCann). Why so many recently while there were so few before? In the Ventura game, the Sox trailed the Cardinals at home by 4 runs in the bottom of the 9th with 2 outs and no one on base. After Albert Belle hit a 3-run HR, Ventura hit his tying HR. Then he hit a 2-run HR in the 11th. Presley's was opening day and his game winner was a grand slam. Mondesi's was opening day as well. Beltre drove in all the Dodger runs in his game (they won 3-2). Crede's game winner was also a grand slam and it was on the anniversary of Jeff Heath's game. Crede drove in 7 of the 8 runs for the White Sox that day. Update 5-20: At Baseball Musings, commentor npbcardguy mentions a game when Mike Young of the Orioles hit a game tying HR in the bottom of the 10th and a winner in the 12th. Click here to see the boxscore and play-by-play. Does anyone know of any other games like that? For the first week of May (as I reported last week), the AL had an OPS of .681 and the NL had .674. So that means this past week was better. The AL would have been about .729 and the NL about .724. But neither one of those is a very torrid pace. Not exactly the kinds of numbers that conjure up images of slugfests. For the whole season, the AL has an OPS of .711 and the NL has .706. 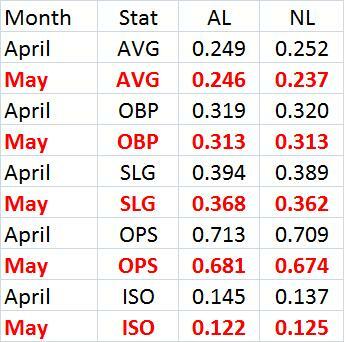 So far this month, both leagues have a lower isolated power than they did in April. The AL fell from .145 to .133 and the NL has fallen from .137 to .131. The AVG is just the simple average of each of the first two months. It looks like May usually has slightly more PAs, but this is probably a good approximation. The Total column is the MLB OPS for the entire season. 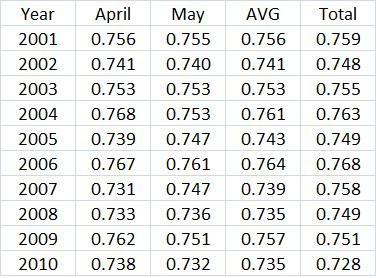 In only two seasons was the overall OPS 10 or more points higher than for April/May. The average is for the whole season OPS to be 4-5 points higher. So it looks like we are in for a very low offensive year. Right now the MLB OPS is .708. The last year it was lower was 1992 when it was .700. The lowest from 1993-2010 was .728 (last year). The next lowest was .736 in 1993. 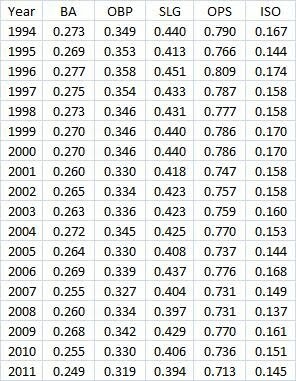 The simple average from 1994-2009 was .760 with no season being lower than .748. In 8 of the 13 seasons from 1979-1991, it was higher than .708. 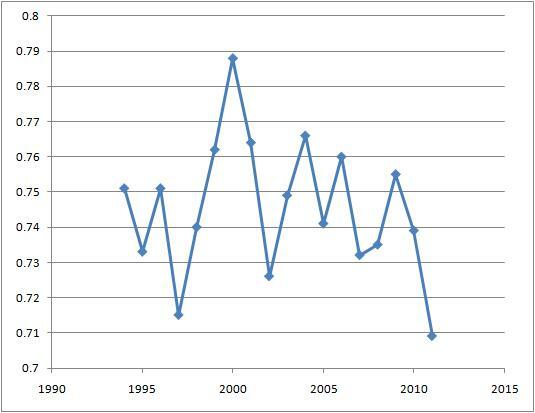 So, by recent historical standards, we are having a very low-offense year. Since I mentioned Paul Konerko last week and his general patter of doing much worse in May than he does for the whole season, his OPS so far this month is 1.212 after .836 in April. One guy going against the trend is Paul Konerko, who usually does terrible in May. See May Day, May Day! Throw Konerko A Life Preserver. But in April he had an .836 OPS while it was 1.123 in May through yesterday. And today he went 5-for-5! His career April OPS is .860 while in May it is .719 (the lowest of any month in his career not counting March when he has only 12 ABs). His overall career OPS is .855. Yes, hard to believe that Willie Mays is 80. But no one knew he was the "Greatest All-Around Player" until last December when I crunched the numbers. Okay, that's a stretch. But here is that post again. It was A Crude Measure Of The Most "All-Around" Players Since 1957. "I suppose the "best all-around player" argument could go like this (keep in mind this is not my argument and not one I even agree with, but one that could conceivably and logically put Walker #1 in his era): There are five traditional baseball tools: hitting (for average), hitting for power, running, playing defense, and throwing." See Cooperstowners in Canada: Larry Walker should be the second Canadian player elected to Cooperstown. Multiply Gold Glove awards times 30. The idea here was to scale a great player in this stat to a great player in HRs or SBs. Brooks Robinson had the most GGs among position players with 16 and 16*30 = 480, close to 500. Divide non-HR hits by 5. If a player had 2500 non-HR hits, you get 500. Multiply SB*HR*non-HR*GG (with the above mentioned adjustments being made for GG and non-HR). If player had no GGs, I stopped multiplying so they did not end up at zero. If I started with his stats from 1957 on, when they started giving out Gold Gloves, Mays gets .378. If I gave Ty Cobb 10 Gold Gloves, he would get .306. 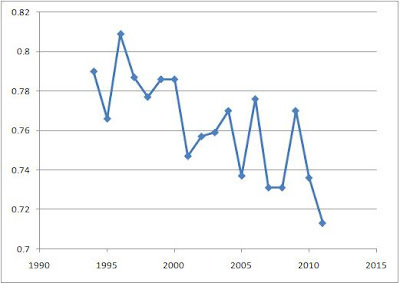 That is partly due to playing mostly in the deadball era, when HRs were hard to come by. Even if a player tried for HRs, he might not have gotten many. If Cobb had 10 GGs and 273 HRs, then he would have .378, what Mays had from 1957 on. Of course, Cobb is helped by the dead ball era because there was alot of stealing going on. If DiMaggio had 10 GGs, he would get .363. He's hurt by the low SB total (30). It just was not an era when player tried to steal much. He was fast, reaching double figures in triples 8 times, even doing it at age 35. Yankee stadium helped him there with its big outfield. He had 73 triples at home and 58 on the road. But if you double that 58, it is still more than 100. He finished in the top 5 in triples 8 times. But then playing at Yankees stadium hurts his HR totals since he was a righty. He had 213 on the road. If he had 426 career HRs, he would get .378. But if I give him more HRs, his non-HR hits might need to be reduced, which would lower his rating. Some of the long balls he hit in Yankee Stadium that were not HRs were outs and some were doubles and triples. I sure don't know what that break down would be. This was posted to the SABR list by Tom Ruane who does great work for Retrosheet. After 29 games, both Matt Holliday and Lance Berkman of the Cardinals are batting over .400. This got me to wondering about the last time (or times) a team had two players hitting .400 or more at least thirty games into a season (only counting players with at least 3.1 plate appearances per game played). You can click on the table to see a larger version. For Cochrane and Simmons, it is after the first game of a double-header. The second number in parenthesis following each player's name is his final batting average that year. Editor's note: I am not sure if I had heard of Austin McHenry before. Seamheads has a great article about him. See The Promising Life and Tragic Death of Austin McHenry by Mike Lynch. It seems like alot of people have noticed the low offensive output this past month. So I am basically just posting some numbers without much analysis. It does seem like April hitting helps predict what the reast of the year might be like. See Does The "High" April Slugging Percentage Mean Anything? The next two tables show the AL & NL hitting for March/April each year from 1994-2011. 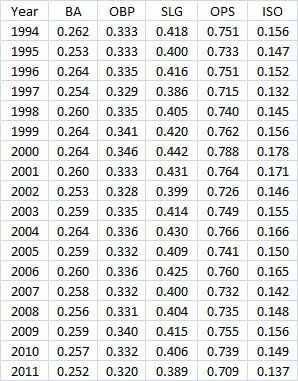 Data from Baseball Reference. The AL comes first. Now the OPS in April, AL first.